* This is my paper in BusinessWorld last Wednesday. 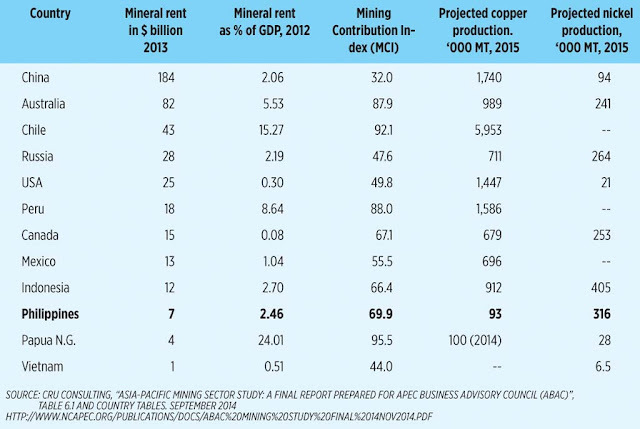 The Philippines’ mining potential is inversely proportional to government mining policies. 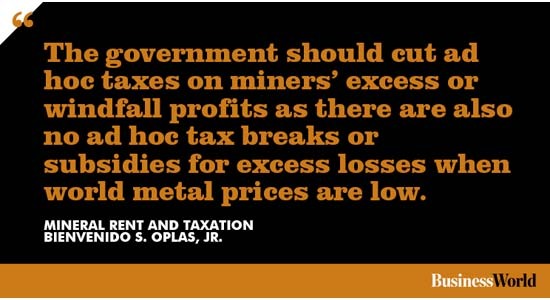 Until about two years ago, the debate was on how much tax hike would be imposed on mining. Then early this year, the debate shifted to outright suspension and cancellation of operations by many mining companies. After the Commission on Appointments rejection of Ms. Gina Lopez as DENR secretary last May 3, the uncertainties have greatly subsided and certain sectors are reviving the old debate -- how much tax increases to impose on big mining companies. Many of the anti-mining sentiments and groups will be jumping on this issue. Very high taxes on metallic mining companies will produce three results that are all favorable to them: (a) some operating companies will be forced to close down especially when global metallic prices are low; (b) planned projects or expansion of existing mines will be discontinued; and (c) companies that continue to operate will be forced to somehow underdeclare output and these groups will further demonize them and lobby for their closure. In some developed countries like the US, Canada, and Australia, it seems that even big environmentalist groups do not lobby for mining closure but their counterparts in the Philippines are so adamant in this philosophical nirvana. 1. Mineral rent: the difference between the value of production for a stock of minerals at world prices and their total costs of production. This rent is not the same as value added to GDP. Rent is pure profit (price minus marginal cost multiplied by quantity) while value-added is the sum of earnings from production that are due to residents. Thus, salaries of mine workers are included in GDP value-added but not in rent. 2. Mining Contribution Index (MCI) is calculated based on aspects of mining contribution to national economies, composite for three variables: (a) Mineral export contribution in 2010 as percent of total merchandise exports, (b) Increase/decrease in mineral export contribution 2005 to 2010, and; (c) Mineral production value as a percentage of GDP in 2010. 1. 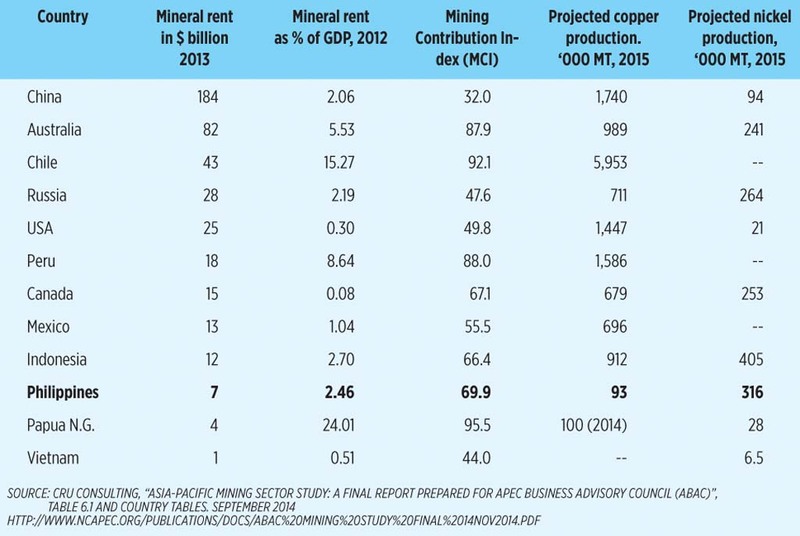 China being a powerhouse producer of copper, silver, zinc, lead, and gold is the world’s biggest mining country despite having a low MCI. Australia comes second and its output is almost twelve times than that of the Philippines. 2. Countries on the “ring side” of the Pacific Rim generally have higher MCI -- Australia, Chile, Papua New Guinea, Peru -- than those a bit far from the Rim. 3. The Philippines is estimated to have $1 trillion-mining potential yet its actual output in a year is low, only $7 billion in 2013, much of it from nickel production as the country is the world’s second biggest producer of nickel, next only to Indonesia. So a rich and developed Australia allows and optimizes mining while a poor Philippines with big potential for mining discourages it, at least in the minds of many environmentalists and some accidental DENR officials. Responsible mining is happening here and abroad. So long as local mining companies follow the law in environmental protection and rehabilitation, and doing plenty of community projects as specified by law, they should not be demonized and over-taxed and/or over-bureaucratized. One, do not further increase taxes as existing taxes, fees, royalties, bonds, fines, mandatory contributions, mandatory community projects, and environmental rehabilitation are already high and plentiful. Two, the government should also ensure stable tax rates, or reduce demand for ad hoc taxes on excess or windfall profits as there are also no ad hoc tax breaks or subsidies for excess losses when world metal prices are low. Tax stability is more useful for private players than giving them certain fiscal privileges because these policies may later be challenged and reversed. Having rule of law in mining audit, environmental rehabilitation, and tax stability is the single most important function of any government in economies with proven high mining potential. The Philippine government should take this path.